Adobe recently announced that they're no longer releasing or developing new features for their Muse web design platform and will discontinue technical support in 2020. Muse was Adobe's attempt at producing a Wordpress replacement but this difficult to use website builder never caught on with a large audience with one exception, graphic designers. For graphic designers with considerable print experience using other Adobe products like InDesign, Illustrator, and Photoshop, Muse was a useful tool. However here at Means-of-Production, we don't create websites for graphic designers; we develop websites for builders, architects, interior designers, and landscape designers. This quite simply is the reason we've given up on Adobe Muse and have transitioned to Squarespace as our go-to tool for website building. When it was first introduced in 2012, Muse solved a problem for graphic designers. It gave non-web designers a platform, if they were fluent in other Adobe Creative Suite products, to create websites without having to convert design files to HTML. That meant no dragging HTML files or coding in a content management system like Wordpress, Drupal or Joomla. In theory, a graphic designer-friendly website builder is a good idea, but it leaves out one crucial element, what is a client to do if they want to make a change to an Adobe Muse website? The answer is they either need to learn Adobe's Crete Suite software or they have to contact their designer to make the changes, incur an expense, and wait until they can make the changes. Not very practical. Concerning the feature set, while Muse is graphic designer-friendly, it leaves much to be desired from a practical developer standpoint. Business websites need to function as a means of developing brand identity and awareness, drive traffic, and allow for the conversion of leads as well as providing online sales functionality. Adobe neglected to include many features that today's businesses rely on from their websites. With no built-in blogging capability, no e-commerce support and no support for either IOS or Android apps, Muse severely lacks in “real world” functionality. The most robust feature offered by Muse was its design from scratch platform, meaning there are no included themes. There's plenty of customization features like adding scrolling effects, setting colors, shapes and icons and more. Unfortunately, the whole user interface was confusing – so accessing these options can be difficult. So What's Next For Adobe Muse? A slow death. As we mentioned above, as of March 2018, no further updates or new features have been added. However, there hasn't been any significant changes to the platform since the last update in late 2016 added responsive elements. In March of 2020 technical support will cease and the platform will exist until browsers are no longer able to publish the code it generates. The truth is that we've been seeing weakness in the Muse space for quite some time. That's why we use Squarespace exclusively for our clients. 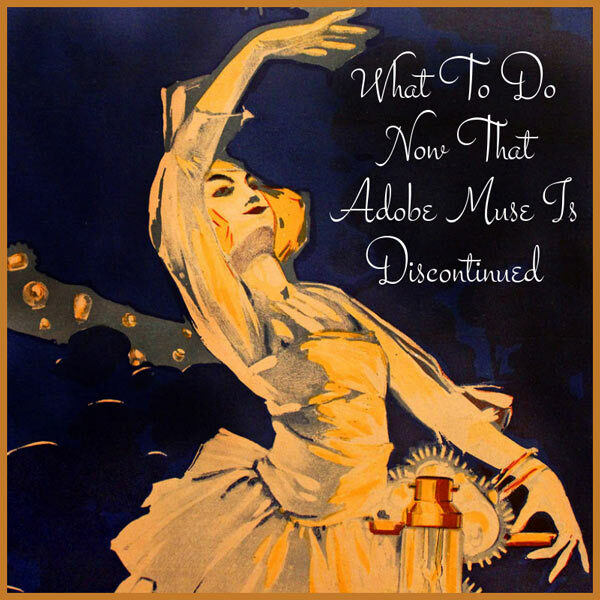 It's been clear that muse was no longer a priority for Adobe and while the timing of the announcement to shut down the platform was a bit of a shock, it's not too surprising. Among several factors for choosing the Squarespace website builder over Muse is the built-in blogging capability Squarespace offers. A website blog is a must-have content marketing and SEO tool for businesses today. Adobe Muse is actually a graphic design tool that was created to meet the needs of print designers (a predominant user base for Adobe Creative Suite). It was a solution to design problems while ignoring core business needs like blogging with intent. With no blogging functionality built into Muse, business owners were forced to find an alternative method for publishing blog articles. This method could cause damage to your brand and reduce the SEO that comes with an off-site blog platform. While considering the demise of Adobe Muse, the Abraham Maslow quote comes to mind - "If the only tool you have is a hammer, you tend to see every problem as a nail." Our Recommendation: Move To Squarespace! A website builder that allows anyone to make content updates in less time than it takes to call a designer. Search engine optimization and landing pages are built-in. Design templates with full-bleed images that allow home improvement firms to exhibit photographic portfolios in a full-screen format. Hosting and content management costs are a reasonable $18.00 a month for the business level services. Third party plugins are unnecessary which eliminates the need for website updates to prevent malware and hacking. Squarespace is a flexible website builder and hosting platform that provides your business with the functionality you need to grow your brand. As of this writing, no Adobe product offers a direct replacement for Muse. Why build your site on a platform that will be obsolete in a few years? Choose Squarespace and avoid the hassles of unpredictability and lack of support. Means-of-Production builds search engine optimized Squarespace websites, writes blog articles and maintains inbound marketing campaigns for clients nationally. Our services are used by architects, interior designers, design-build contractors and landscape design firms. We can help your site get found online, educate prospects, and position your firm as the go-to experts. Contact me for a free video review of your online marketing efforts.